"It is about a cow who has a wee pooing problem. When the farmer attempts to take her to the vet much hilarity ensues and in the end we see that her disability becomes an asset as the farmer is able to sell her poo as manure and she no longer spends her time alone in her field bu... read full description below. "It is about a cow who has a wee pooing problem. When the farmer attempts to take her to the vet much hilarity ensues and in the end we see that her disability becomes an asset as the farmer is able to sell her poo as manure and she no longer spends her time alone in her field but has lots of new friends"--Publisher information. Bruce Potter is an international award winning illustrator of over 110 books. 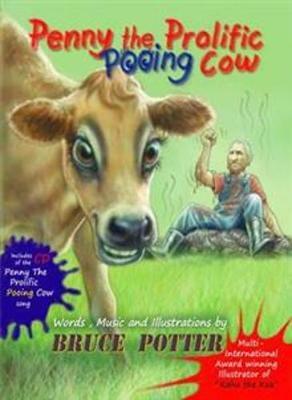 Penny The Prolific Pooing Cow is his first book as the author , illustrator , songwriter and music performer. He tours a large number of schools performing his show and inspiring children to love books and be creative. He has performed as the lead in a number of musicals and has played in numerous orchestras. He has won a bronze medal at a World Bench Press Championship and currently loves his karate training. He lives happily with his wife and children in their own slice of paradise in New Zealand.